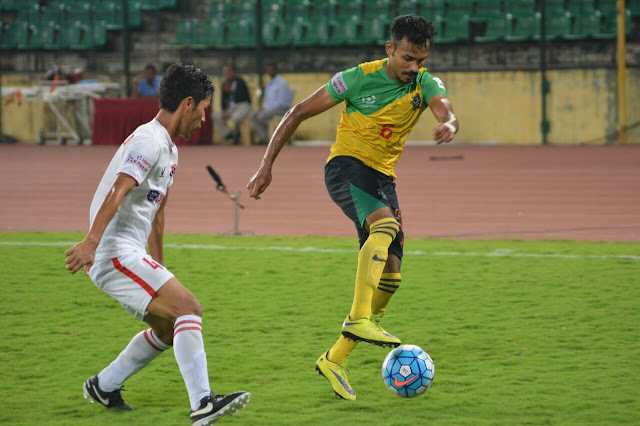 Two wins in two matches for Shillong Lajong FC as they defeated the Mumbai FC 3-1 in their home at the Jawaharlal Nehru Stadium, Shillong. Aser Dipanda Dicka netted a brace to ensure the victory for the North East side before Chinglensana added more solidity to the final result. Things got worse for Mumbai FC as their goalie Laxmikant Kattimani was given marching orders for handling the ball outside the box. Chennai City FC after their spirited display against Mohun Bagan, notched up their maiden victory of the Hero I-League earlier today. Playing against the much fancier opponents - Aizawl FC, Chennai City FC produced a solid display to register a 2-0 victory. Marcos Tank's goal in the 53rd minute broke the deadlock and it was a special one to remember. From around 25-30 yards his shot found the back of the net with the Aizawl FC custodian staying rooted to the spot. Charles D Souza doubled the lead in the added time of second half when he converted from the spot after Kingsley's tackle on Charles was deemed illegal. The final moments of the game saw some heated exchange between the two sets of players after some reckless tackles flying in from Aizawl FC. Referee Santosh Kumar handled the situation quite well after brandishing several yellow cards.